Reproductive and Child Health Programme is an integrated and comprehensive programme based on realistic decentralised area specific microplanning tailored to meet the local needs. There is adequate emphasis on provision of good quality of services under the programme. The present paper traces the genesis and evolution of the RCH programme followed by its objectives, strategies and components. Various mechanisms for the implementation, monitoring and evaluation of the programme are discussed. The programme is analysed critically and suggestions for improvement are provided. The major emphasis of Reproductive and Child Health (RCH) programme in India is delivery of client-oriented, demand driven and broader ranges of high quality, safe and effective services for children, adolescents, mothers and reproductive age group population at large. Increased client satisfaction is considered as main determinant for improved acceptance of the services. Thus, well trained and motivated health personnel are necessary to deal with highly sensitive, personal health issues of the clients, like contraception, abortion, infertility services etc. 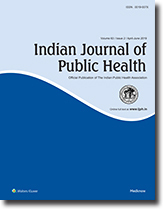 The Indian Public Health Association organized total 10 workshops in several places of India (A total 322 members, composed of Medical Administrators (54.7%), Faculty members of Medical Colleges (24.5%), Sociologist and Nutritionists (13.9%) and also public health personnel (6.9%) participated in the workshop). Learning objectives and lesson plans etc. were formulated. Accordingly the contents were incorporated in a module, validated and pretested. The training sessions were conducted by briefing, discussion, group exercise and VIPP method and were evaluated by semi structured. The pre/post assessment schedule and scored scale of feedback from participantsAE were used for evaluation. The pre-post assessment scores revealed wide variations of mean score among the participants of several places. Significant post workshop improvement of knowledge was quite evident, with few exceptions. The group variants of pre and post score of results was considered to be due to heterogeneous groups of participants. Review of objectivity and quality of the questionnaire were felt as necessary.